Osteria Mozza is a highly acclaimed and popular restaurant here in Los Angeles. 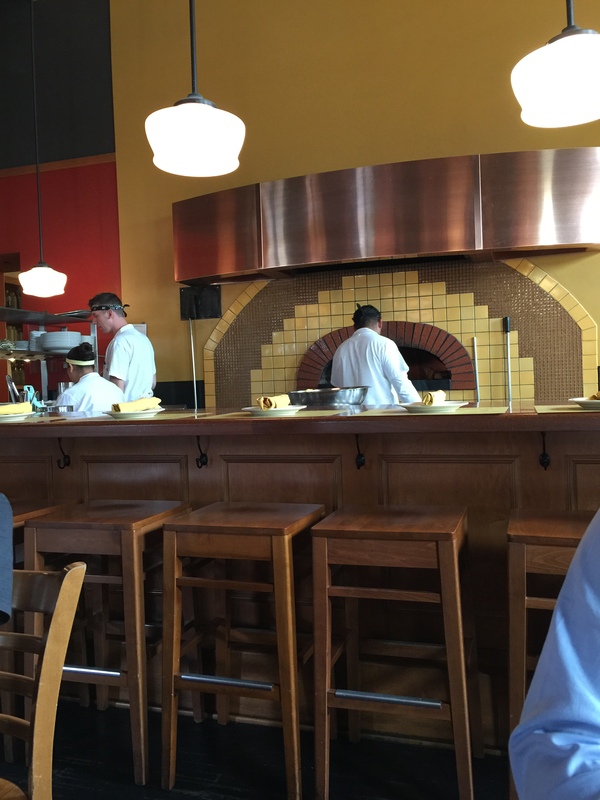 Owned and operated by celebrity chef Mario Batali along with his partners Joe & Lidia Bastianich, the authentic Italian pizzeria has developed quite a following. I’ve mentioned to my husband a couple of times over the years that I’d be interesting in checking the place out one night. But for one reason or another, we’ve never made it to Osteria Mozza. However, one weekend, out of the blue, to try something different, my husband made a restaurant suggestion for lunch in Newport Beach at a close cousin to Osteria Mozza. 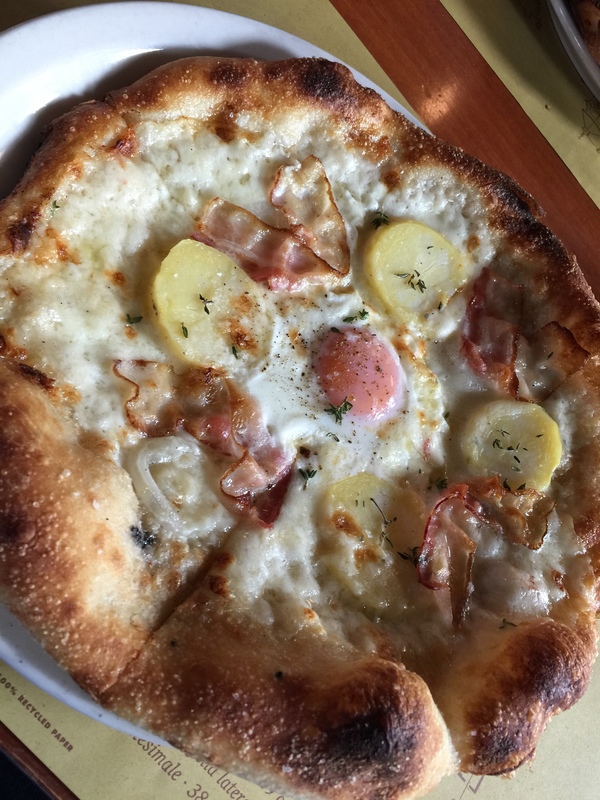 Pizzeria Mozza is owned and operated by the same restaurant group, along with Nancy Silverton, an acclaimed Southern California chef who won the 2014 James Beard Foundation award for Outstanding Chef for her role in popularizing artisan breads and sourdough in the United States. 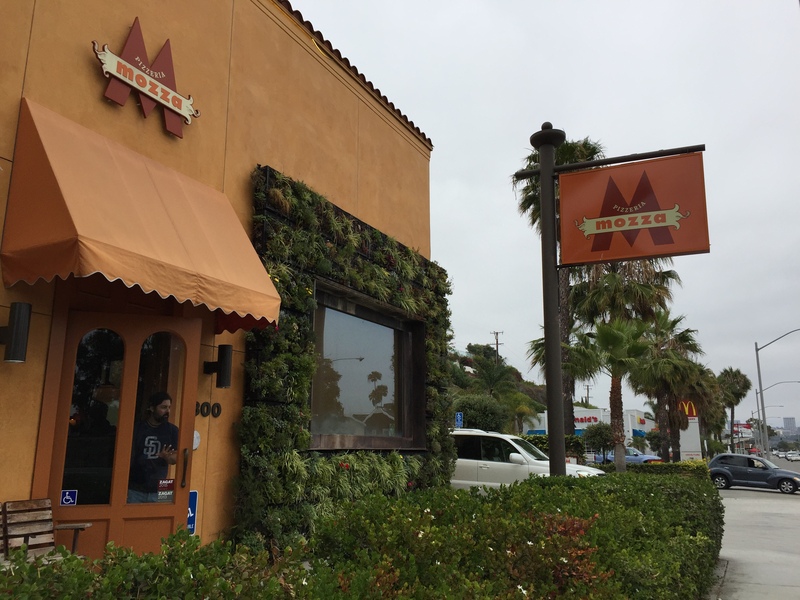 Five years after opening Pizzeria Mozza in Los Angeles, Mario Batali, Joe Bastianich and Nancy Silverton decided to expand their empire south and moved down to Orange County. Pizzeria Mozza is described as Nancy Silverton’s expression of “unique aesthetic and approach to cooking: focused but not fussy, straightforward and always uncompromising.” Located on the famed Pacific Coast Highway, this restaurant is a laid-back extension of what Orange County beach life is all about. With a beautiful open kitchen and wood burning pizza oven, the restaurant is small and cozy and completely unpretentious. On this Sunday afternoon, people strolled into the restaurant in jeans, t-shirts and flip flops just looking for good, home-cooked Italian food. It’s like your neighborhood pizza joint, or at least that’s the vibe you get. Completely relaxed and unpretentious. After browsing through the drink menu, my husband decided to order Monk’s Cafe Flemish Sour Ale. My husband is on a Belgian beer kick right now, especially trappist monk beer, which is a favorite of his. So when he saw this Belgian beer on the menu, he had to give it a try. 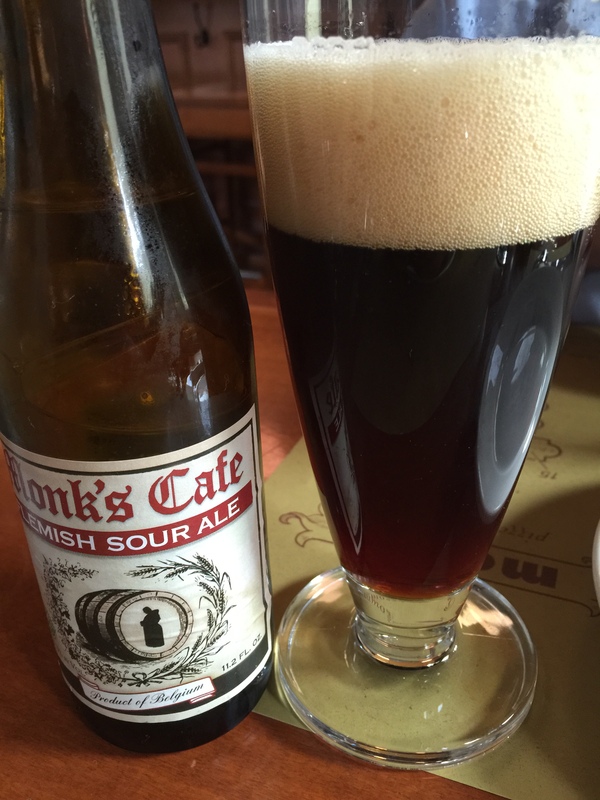 Named after a famous bar in Philadelphia called Monk’s Cafe, the owner, who is a huge Belgian beer fan, convinced a small brewery in Belgium to bottle their famous beer under a private label for him called Monk’s Cafe Flemish Sour Ale. The beer is said to have a mildly tart sour ale flavor with bit of a sweet and sour flavor profile. My husband said that he could definitely taste the sour in the beer and he liked it. He’s never actually had a beer that tasted like this before. It was different, but refreshing. As a starter, I had heard that the restaurant’s pane bianco was quite good, so my husband agreed that we could start out with a dish. 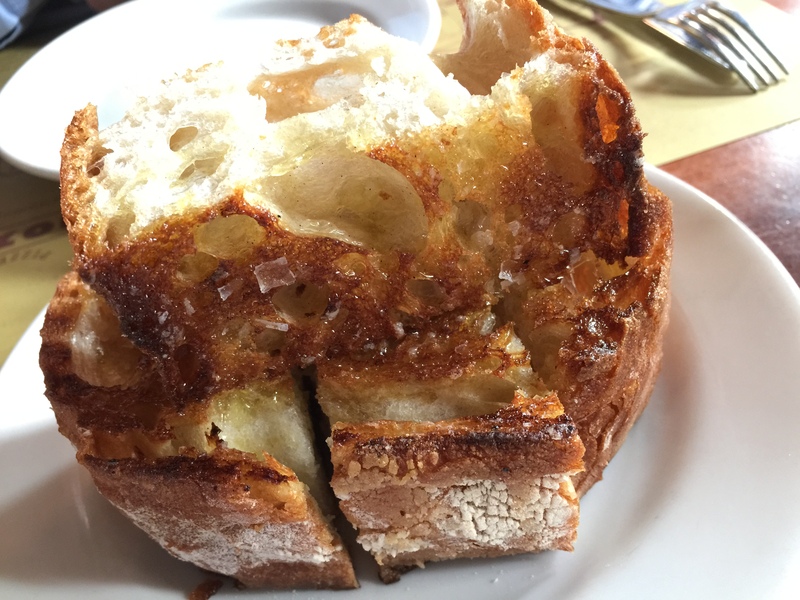 The pane bianco, or white bread, is the restaurant’s own fresh baked bread finished in their wood burning oven, topped with just some simple extra virgin olive oil and some sea salt before being served at the table. The bread was absolutely incredible. Perfectly crusty and baked on the outside and airy and light on the inside. We loved how simply it was dressed with just some olive oil and flaky salt and nothing else. It was some of the best bread that we’d ever had before. It’s easy to see why Nancy Silverton is such a bread guru. For lunch, we each decided to order our own pizza. My husband chose the prosciutto di parma, rucola, Bianco DiNapoli tomato and mozzarella di buffula pizza. In layman’s terms, that’s prosciutto, arugula, tomato and fresh buffalo mozzarella. After one bite, the first thing my husband raved about was the crust of the pizza. In his words, he’d never tasted pizza crust as great as the crust on this pizza before. It has to do with the wood oven and how blistered and crusty and crunchy the crust of the pizza was. The tomato sauce was tasty and fantastic. And my husband, who’s not the biggest arugula fan in the world actually liked the addition of the arugula on this pizza to help balance out the flavor of the acidic tomatoes. There was just enough greens, but not too much that felt like he was eating a salad instead of a pizza. And Pizzeria Mozza was quite generous with the amount of prosciutto on the pizza as well, so it provided a nice sweet, and little bit salty, flavor to the pizza that paired well with the flavorful tomato sauce. For my pizza, I ordered one made with egg, bacon, Yukon gold potato and Bermuda onion. 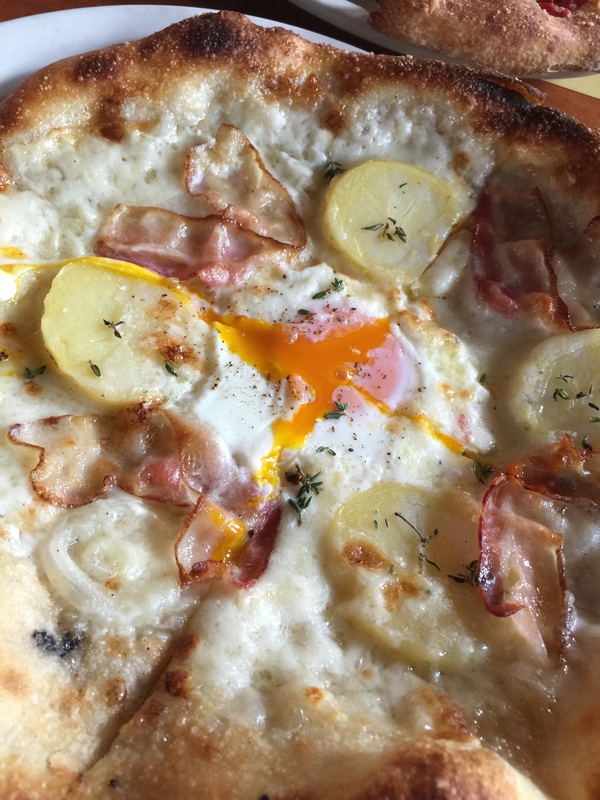 After the pizza is cooked in the wood fired oven, and cut into four slices, an egg is cracked open and put right onto the center of the pizza. By the time the pizza is brought to the table, the heat from the pizza cooks the egg whites, but leaves the center perfectly yolky. Use a fork to crack through the egg yolk and watch it spread out over the pizza. I think after one bite, I was in love with this pizza. It was extremely tasty, and that egg yolk makes the pizza. It adds the creaminess and richness to the pizza which is just phenomenal. You can taste all of the individual ingredients – the egg and the bacon and the delicious Yukon gold potato and the sweet Bermuda onion. The potatoes are perfectly tender and slightly sweet. That starchiness gives the pizza some body and the Bermuda onions add just a hint of sweetness to balance the salty of the bacon. It’s like breakfast, but on a pizza. This may be my favorite pizza of all time. After a terrific bread starter and a whole pizza each, my husband and I were full. We debated whether or not we should get a dessert at all, but after I saw the dessert menu, I couldn’t resist splitting dessert with my husband. Cioccolato was my selection. 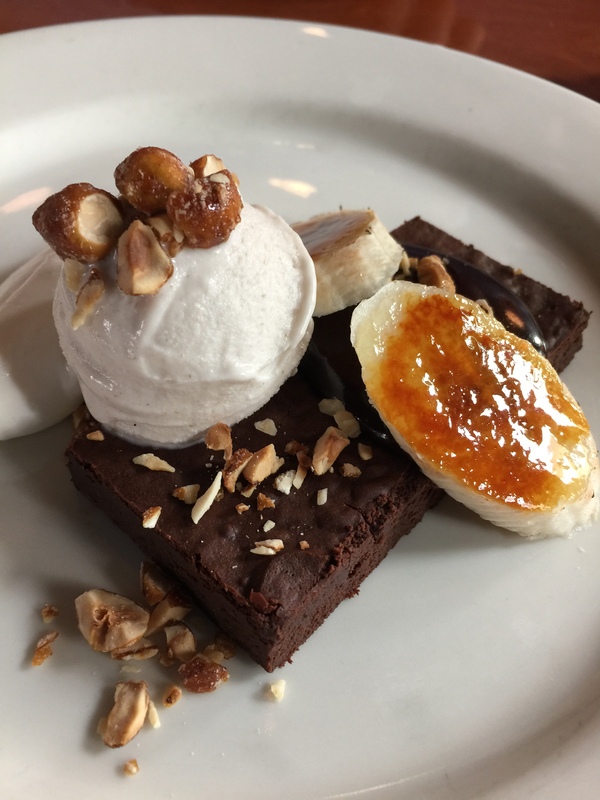 Made with hot fudge, banana gelato, and candied hazelnuts, how could I resist. I couldn’t get past banana gelato. I’m banana crazy and this is right up my alley. This gorgeous dessert was so yummy, my husband and I both enjoyed it. The bruleed banana slices were a great addition and added that terrific banana flavor. That’s not a chocolate brownie you’re looking at, but chocolate fudge. It had to have been made with dark chocolate because it had this terrific slightly bitter flavor to it. It’s the perfect compliment to creamy, delicious and subtly banana-flavored gelato. The crushed nuts added crunch and texture to the dish. This was such a rich and decadent, but incredibly yummy dessert. I’m so glad that I decided to look at the dessert menu. Pizzeria Mozza was a great find. 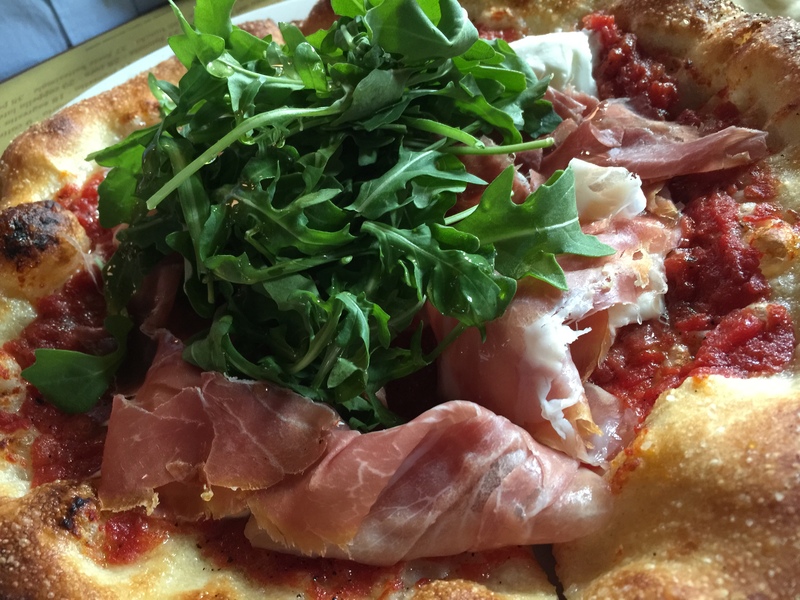 Located in a neighborhood where you’d expect to walk into a high-end, pretentious Italian restaurant, what you really get instead is a local, friendly, laid back pizza joint. They just make some of the most incredible pizza I’ve ever had. The wood burning oven turns out pizzas, bread, and meatballs that are perfectly cooked, and bubbly hot and just delicious. This is seriously some of the best bread and pizza crust ever. You can bet that my husband and I will be back to Pizzeria Mozza in the near future. The restaurant is incredibly deserving of all of the accolades it has received.